Well, I was rooting for the Cardinals since it was their first trip to the Super Bowl, and the Steelers have had their share of championships, but it was not to be. The game was great though, and the pre-game and half-time shows were fun. The commercials were somewhat lackluster, and the hands-down best one was the Doritos “crystal ball” commercial. To see all the ads, go here. 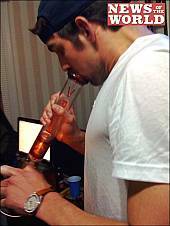 Olympic swimming champion and All-American-Boy Michael Phelps recently got tagged in a photo showing him taking a hit of marijuana at a party, and now a lot of his endorsement deals may be in jeopardy. Well, if it’s any consolation, the pipe shown IS the official bong of the 2008 Summer Olympics.